Currently working on the installation of components located beneath the car, Mike is also keen to learn skills from other areas of the manufacturing plant and this allows him to transfer these skills to his practical work at college. Mike is looking forward to spending more time at the Home of Rolls‑Royce at Goodwood, to develop his skills further as he progresses through his apprenticeship. Mike took part in a team bonding trip to Devon last year, getting to know other apprentices and developing the relationship further. After spending time as a teaching assistant in a special needs school, Hannah decided that a career change was just what she needed. She started applying for apprenticeships focusing on her passion for cars. Hannah’s Grandad was delighted that she had decided to work at the prestigious Rolls-Royce Motor Cars as she had learnt her engineering skills from him at a young age. 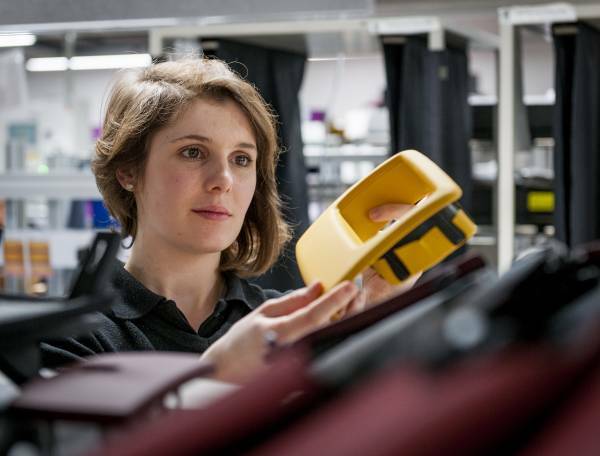 The ability for real ‘hands-on experience’ was a huge attraction for Hannah and she is currently helping to building the tail gate for the Rolls-Royce Cullinan, even being given the responsibility to support others at her work station. Working at The Home of Rolls-Royce at Goodwood is inspiring for Hannah. The opportunity to walk in every day and be surrounded by the incredible colours and sights of the best cars in the world is immensely motivating. Hannah is hoping to continue in her football career with the Rolls-Royce staff football team. She previously played at Chelsea FC’s Centre of Excellence, making several junior team appearances and scoring goals. While studying for A-Levels, Freddie started to consider apprenticeships as a future career option. Looking online, he decided that Rolls-Royce was the only option. On hearing that he is now working at Rolls-Royce, Freddie’s friends were very impressed. The apprenticeship has already given Freddie the opportunity to work around the business in a number of roles. This has allowed him to develop his skills, particularly in areas where he has had no previous experience. His proudest achievement to date is working with a team on production car seats. Working with the finest materials and given the responsibility to work on the end-product has proven to be very rewarding. Freddie is looking to develop his career at Rolls-Royce further upon completion of his apprenticeship. Georgina’s previous experience couldn’t be any further from the world of luxury motor cars. She ran a livery yard in the local area, and despite her family history in the agricultural industry, she was looking for a new direction in her career. She worked alongside a saddler in her previous job and was inspired to extend her knowledge and skills with leather. Rolls-Royce was one of the few companies that provided her with the opportunity to work with the finest materials in the world and she soon found out that car leather is very different to saddle leather. Georgina is planning on using these new skills to develop her career further at Rolls-Royce Motor Cars. Lucy was looking for something to do upon completing her A-Levels; University wasn’t for her and she was looking to work in textiles. 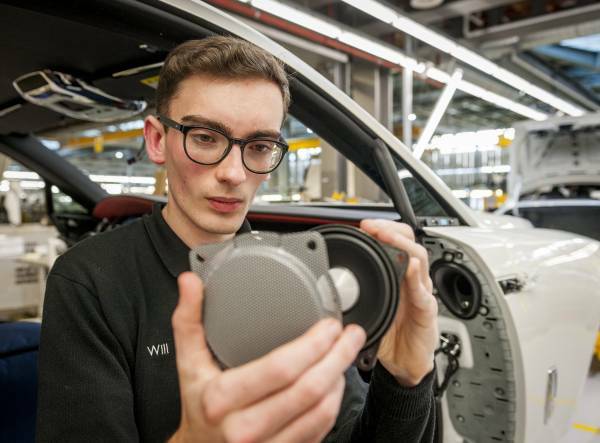 The Rolls-Royce Apprenticeship Programme was recommended by school teachers. It was clear that, once she had done some research, Rolls‑Royce was the only place to go. 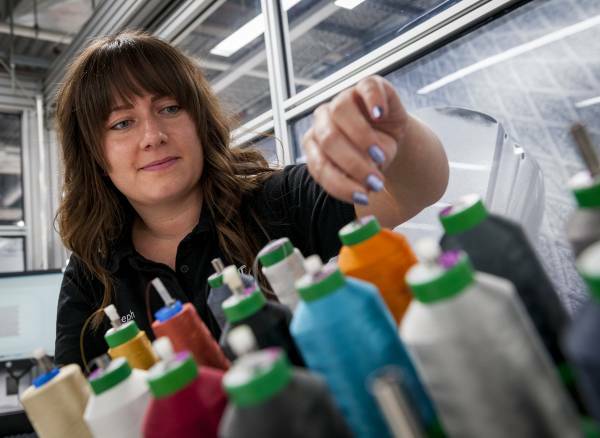 For someone interested in textiles, working with the very best materials in the world and with industry leading research and development, Rolls-Royce Motor Cars provided an excellent opportunity. Lucy is currently working on door assembly and covering, learning how each individual piece is handcrafted and developed before being assembled in the final car. 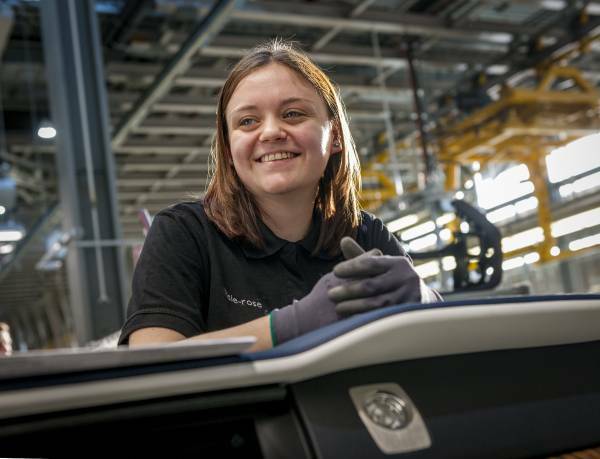 The responsibility given to apprentices is highly rewarding, with Lucy playing an active role in the team and working in a team on production vehicles. Lucy will next be working with planning colleagues to explore how the team behind the scenes supports production. Mia has been working on cars from a young age with her father, passing him the tools as he worked on the car. She also used to make advent calendars with her mother so she has always been ‘hands on’. After leaving school and heading into an administration job, Mia realised that she had to get back to working with her hands. She made the bold decision to move down from Liverpool to join the team at Rolls-Royce Motor Cars. Being able to develop her skills and then put them into practice at college has proven very rewarding. This has led to larger scale college projects such as creating a headboard. Mia is looking forward to developing her skills even further, getting the opportunity to work in various departments as she develops her career at Rolls-Royce. Clare has a varied history in the textiles industry, working as a textiles designer and then owning a local shop. Looking for a change in direction she searched for apprenticeship opportunities at her local college and was recommended Rolls-Royce as a local employer that could expand and develop her skillset. Clare has always been a ‘petrol head’ so the opportunity to work for Rolls‑Royce Motor Cars and work with the best cars in the world was too good to turn down. Clare still can’t quite believe that she actually gets to come into work every week alongside such beautiful motor cars. Everyone is always so enthusiastic when she discusses her job role and she is now the envy of many. Clare was delighted to be assigned work on the Bespoke side of the business, learning her trade amongst some of the finest craftsmen and women in the world. Clare said, “Having a company spend so much time and investment in your development is hugely rewarding for anyone looking to do an apprenticeship”. Ammar started his career working on the London Underground and was recommended the Apprenticeship Programme by an employee of Rolls-Royce. He has found the Programme to be very rewarding with real ‘hands on’ experience with the ‘best cars in the world’. Ammar was keen to work in the automotive industry and when he heard about the opportunity at Rolls-Royce, there was only going to be one role he wanted. Currently working in the ‘marriage’ area, Ammar is given the important role of ensuring the body of the car and the engine become one. This area requires real responsibility and trust in the apprentice performing the role. One aspect that Ammar loves about his role is that it is the first stage where you can start to see the finished product. The opportunities afforded to apprentices is a key reason why Ammar chose Rolls-Royce and he is keen to make the most of these and develop his career further with the company. Ammar commented, “It’s great that Rolls-Royce gives me the opportunity to be the best that I can be”. William finished his A-Levels and decided that university wasn’t for him, after doing some research he decided that an apprenticeship was the best opportunity to learn new skills as well as starting his career at the same time. As a car lover, William would often spot the Home of Rolls-Royce at Goodwood on his way to track days at Goodwood. It was at this stage that a career at Rolls‑Royce became an aspiration. William is particularly proud of working in a team on production cars and helping to fit a windscreen was a particularly important moment. William was also one part of the team that worked on Cullinan, Rolls-Royce’s first SUV, before it was launched to the public. Elsie already had experience at Rolls-Royce Motor Cars before applying for an apprenticeship. She has a relative who works in Quality Management and secured work experience for a week the previous summer. This experience was enough to know that she wanted the opportunity to develop her career at Rolls-Royce. Elsie is currently working on dashboards and this provides the opportunity to work on the world renowned famous clocks and technical instruments that go into a Rolls-Royce. Working alongside world famous cars at the global headquarters is incredibly motivating for anyone working at Rolls-Royce and Elsie advises that she has been “in awe of the place” since day one. After finishing his GCSEs, Callum was unsure what to do next. He knew Rolls-Royce offered a world class Apprenticeship Programme but never thought he would be lucky enough to get a place. He attended a careers talk at his school to find out more and applied instantly. After getting his place, Callum was able to work with some of the finest materials in the world at Rolls-Royce, learning on site and at college as well. Callum used these skills to build a small refectory table and wall cabinet during his early training. He is currently working on his final project of making a large table. Callum is looking forward to working in a number of areas across the Woodshop and learning from the finest craftspeople in the business. He is excited about the opportunities that that the Apprenticeship Scheme offers and what the future holds during his time with Rolls-Royce. Ethan was recommended to the Rolls-Royce Apprenticeship Programme by his teacher who had seen previous students achieve so much in recent years. After talking with a number of the team at an apprentice fair, Ethan decided that the opportunity was too good to miss. Since joining the team at Rolls-Royce, Ethan has worked in a number of departments with different roles and responsibilities. After his first year studying full time at college, he moved on to Supplier Parts Quality. 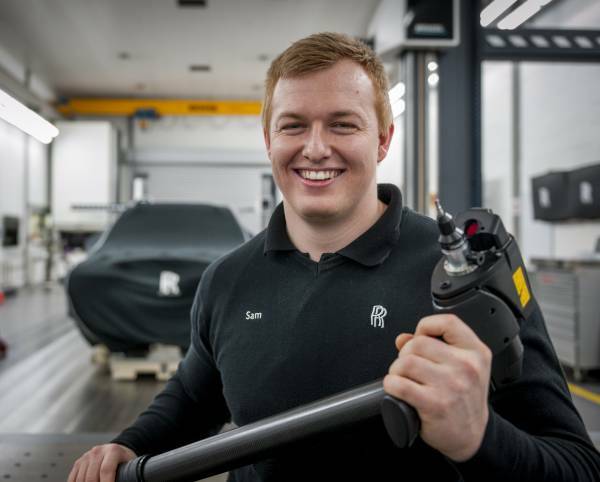 Here Ethan was part of a team that ensures every single part of the car is the finest Rolls-Royce quality. Ethan’s current placement sees him working in a number of department’s learning how the wider business works. The opportunity to work on the assembly line has been one of the most exciting parts for Ethan. “It is amazing to say that I have built Rolls-Royce’s” he says. The opportunity to lead projects has helped support Ethan’s personal development and confidence. 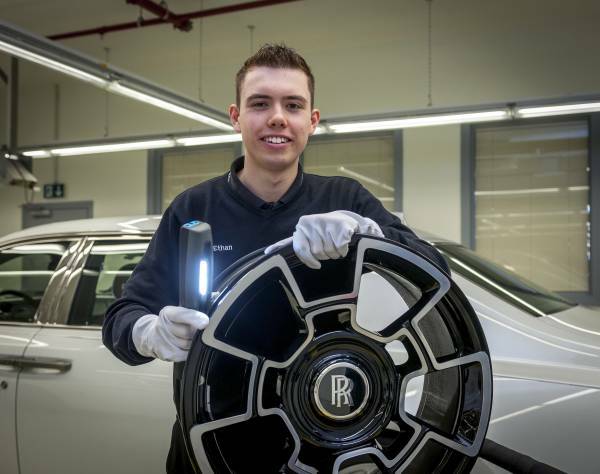 With support, Ethan is leading a project looking into metrology (measurement for the brand new Rolls-Royce Cullinan). The Apprenticeship Programme has afforded Ethan the opportunity to learn new things and gain new experiences that can help further his career. Having completed a degree at the Art University of Bournemouth, studying BA Textiles, Brienny was looking for some hands-on experience. When looking into local textiles job opportunities she came across the ‘Leather Sewing Apprentice’ role at Rolls-Royce. Brienny applied as the role would allow her to utilise her skills and produce a final product. This seemed like ‘the perfect fit’. Since joining, Brienny has completed three, two-month placements within the Leathershop. Her first role was in cutting, then sewing and more recently, in Brienny’s favourite role, seat build. This is where the luxurious Rolls-Royce seats with their numerous massage settings are built. Brienny has been involved in a number of projects during her time at Rolls-Royce. However, her stand out moment was collaborating with the world famous Bespoke department to create a series of leather Christmas decorations. Along with another apprentice, Brienny designed and produced over 1000 decorations that were sold in the run up to Christmas, with all proceeds going to the company’s house charity. For a car lover like Georgia, the prestige of working for the world’s most luxurious car brand was a once in a lifetime opportunity. After studying a Business BTEC and unsure what to do next, Georgia started looking online at apprentice schemes. She had heard amazing things about the scheme from previous apprentices and decided to apply for Rolls-Royce. Georgia’s first week at Rolls-Royce was quite an experience. She was ‘blown away’ by the Home of Rolls-Royce at Goodwood and how friendly and supportive everyone was. The opportunity to go through different placements within the Leathershop was a great opportunity to learn something new every day. The experience of working with the finest quality materials and textiles was a great draw for Georgia: “The materials used at Rolls-Royce are unlike anything I have seen before”. The Apprenticeship at Rolls-Royce has taught Georgia lessons such as how to be independent, working in a team and improving her confidence. The support from management has been key in this, “they have always been there to help me” she says. Sam completed his apprenticeship in 2017 and his career is going from strength to strength. He is currently in the Measurement department, ensuring that every part that goes into a car is up to demanding Rolls-Royce standards. His family and friends were pleasantly surprised to be told where he worked and he always gets asked about his job and the cars he is working on. Sam was made aware of the Apprenticeship when he was given a talk at school. He then explored the opportunities that Rolls-Royce could give him. Asked why Rolls-Royce stood out for him, Sam explained simply, “because it’s the best”. 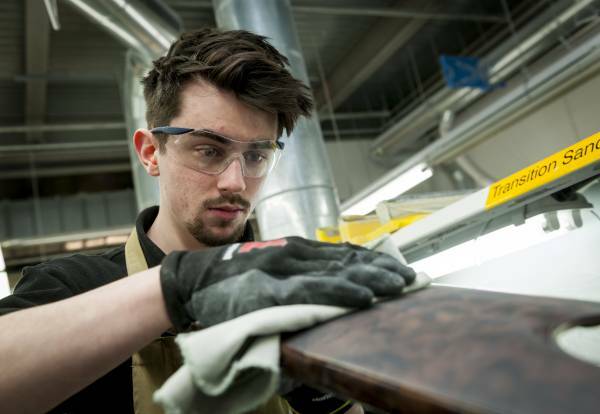 During his apprenticeship, Sam worked across the business including Test and Finish, Parts Validation and Leathershop. After his apprenticeship Sam was part of team that launched the new Cullinan. Before his apprenticeship, Toby was working in finance in an office-based job. He decided that he wanted a change of career with the ability to work with his hands on a daily basis. He had experience with Rolls-Royce Motor Cars as his Grandad worked for the Marque for a number of years and Toby had visited the site several times before. 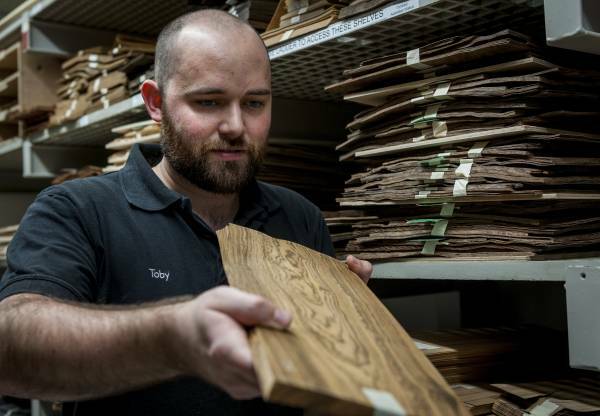 The apprenticeship proved particularly useful to Toby, providing him with the opportunity to work across the production areas and he believes this helped him to establish himself a role once he had completed his apprenticeship. This has also helped him in his new job within the Woodshop, working in the Hydraulic Pressing Area, problem-solving and planning for future production. Jade is one of the Apprenticeship Programme’s many success stories. Having joined in 2011, she completed her apprenticeship in 2014 and is now a Leathershop Bespoke and Production Leader. The key to her success has been working across a number of departments within Rolls‑Royce Motor Cars. This also allowed her to develop networking opportunities within the company. She is grateful for the opportunity to hone her skills with the finest materials at the Home of Rolls-Royce Motor Cars at Goodwood. During her time at Rolls-Royce, Jade has had the opportunity to learn across the business. She has helped at events such as the Goodwood Festival of Speed, and travelled to Dubai and Italy to provide support on regional events. Her proudest job to date was working on a Starlight Headliner for a customer which required hand punching 900 holes to create a unique pattern in the illuminated headline of the car. Jade also one of the team that appeared on the BBC show ‘DIY SOS’ last year, hand-crafting a heat-proof, personalised leather apron to local resident, Amanda Worne. Steph began her three year apprenticeship in 2014, using the opportunity to hone her skills in soft furnishings whilst also networking across the business. She believes that this is what has helped her to develop herself and provide her with the opportunity to further her career beyond her apprenticeship. Steph studied textiles before working at Rolls-Royce but had never worked with leather before. The opportunity to work with the finest materials and industry-leading production facilities was incredibly exciting and an opportunity that Steph relished. She was given the opportunity to travel to Korea to support the launch of Black Badge and has worked on a number of events across the company. She is looking forward to establishing herself in the Bespoke Area in the Leathershop and using her creativity to develop designs further.